Pizza preferences can be a touchy topic, but we think we can all agree that there's nothing quite like a steaming, greasy slice of New York City-style pizza, folded vertically (obviously) and almost burning your mouth because it just looks too good to wait. Luckily for Sydneysiders, there's a cheaper way to get a Big Apple-style slice than booking a plane ticket — and that way is Epic Pizza. Offering giant 11-inch slices, and 12- and 22-inch whole pizzas, the Enmore corner shop is perfect for a quick bite on one of the kerbside tables or for takeaway. Even better, it stays open past midnight on Fridays and Saturdays and delivers right to your door every day of the week. 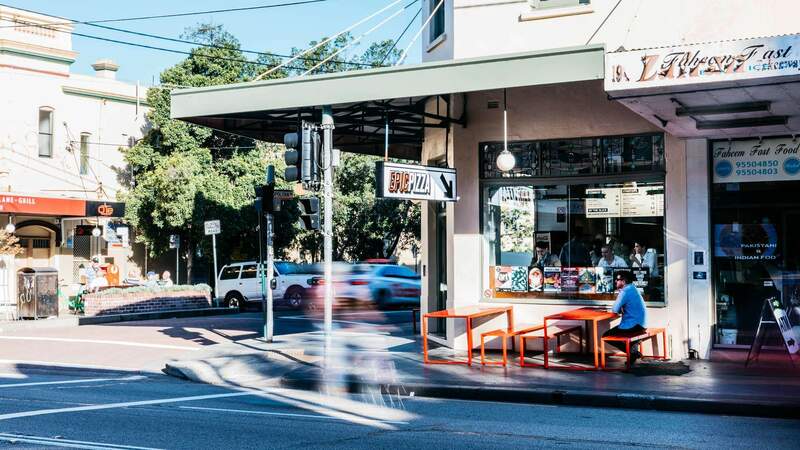 The Enmore Road eatery is the pizzeria's third Sydney location with already established locations in Darlinghurst and Drummoyne. Channeling all things NYC, both in the pizza and decor, Epic Pizza has brought a touch local flair by offering brews from the likes of Grifter and Young Henrys. The menu has also expanded. As well as the usual vegan and pepperoni-topped slices, you'll find waffle fries, nachos, Nutella-loaded calzones and ice cream sandwiches.